board during the Japanese surprise attack. This year, the US commemorates the 77th anniversary of the bombing on Pearl Harbor on Friday, December 7, 2018. Officially known as National Pearl Harbor Remembrance Day, it honors those who lost their lives during the sneak attack by the Japanese on a US naval base in Hawaii in 1941. Following the bombing, President Franklin D. Roosevelt issued a a nationwide call to arms, effectively ushering the US into World War II. On the early Sunday morning of December 7, 1941 sudden news reports of an attack by a foreign power stunned Americans much as it did on 9/11. One of the most violent attacks ever against U.S. forces, the Japanese air force had slipped in quietly over Oahu precisely at 7:55 AM to wreak havoc on the air and navy fleet stationed on the Hawaiian island. The raid -- which came with no declaration of war -- destroyed four battleships and damaged four more in just two hours. Among the American armed forces, there were a total of 2,335 killed, including 2,008 navy personnel, 109 marines, and 218 army. 68 civilians also lost their lives in the attack making the total fatalities 2,403 people. Also lost forever was the American sense of innocence, and the belief that the US was somehow protected from the battles already raging in Europe. On December 7, 1941 the US was suddenly and without warming thrust into World War II. "Pearl Harbor - Into the Arizona" aired in honor of the 75th anniversary of Pearl Harbor in 2016. Amid the destruction on December 7, 1941, five battleships were seriously damaged or sunk and would require extensive repairs to get them into action again. The worst befell the U.S.S. Arizona when a 1760-pound bomb struck its gunpowder store resulting in a massive explosion. Today, the U.S.S. Arizona lies in its watery grave at the bottom of the harbor, with a memorial built directly over it honoring the 1,177 lives that were lost on the ship that fateful day. 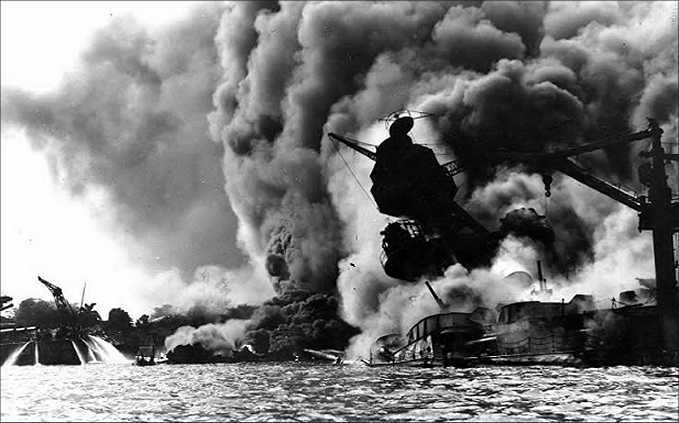 Following a direct hit from Japanese war planes, the USS Arizona burns and sinks in Pearl Harbor. on Pearl Harbor, December 7, 1941. "...a date which will live in infamy"
Shortly following the Pearl Harbor attack, President Franklin D. Roosevelt spoke to Congress and the nation in a radio address now considered one of the most famous American political speeches of the 20th century. Calling December 7th "a date which will live in infamy." FDR rallied Americans nationwide and, amid thundering applause stated that, since the moment of the attack, "a state of war has existed between the United States and the Japanese Empire." Four long years later, hundreds of thousands of lives continued to be lost in the Pacific even as war in Europe was declared over. Horrific scenes of carnage were only equaled by the dropping of two atomic bombs by the US on Hiroshima and Nagasaki, which finally brought Japan to its knees and World War II to an end. For most Americans today, the USS Arizona memorial remains the focal point for commemorating the attack at Pearl Harbor along with tours of the USS Missouri, upon which the Japanese formally surrendered to the US on September 2, 1945. Elsewhere on the mainland US, veteran's groups and American Legion outposts remember the day by honoring surviving soldiers that fought at Pearl Harbor and in the Pacific, along with the placing of memorial wreaths at the graves of the fallen. Attack on Pearl Harbor - Wikipedia - Extensive historical background & photos tell the story including its aftermath with related resources and references, multimedia sound files featuring the FDR's "a date which will live in infamy" speech. 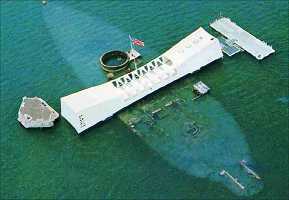 Pearl Harbor.org - Pearl Harbor history & information told in video, audio and text including major speeches, eyewitness accounts, casualty lists, photos.